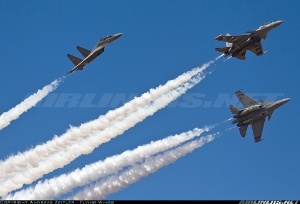 The Airshow was held from February 9th – 13th, with Wednesday being the opening day and Saturday and Sunday opened to the public on a basis of a restricted number of tickets. The opening day was the main highlight from a military point of view with the formation fly-pasts accompanying the official opening ceremony. Though not as big as in the previous day it included a flag parade of three Mi-8, one Antonov An-32 together with two Do228 transport aircraft, two HAL IJT-36 trainer aircraft, five HAL Tejas LCA aircraft (a first-timer to see so many together in the air), five Jaguars trailing smoke and finally a nice break of three Su-30MKI. Of high interest were of course the aircraft that the Indians would show off, and fortunately there were some of them. 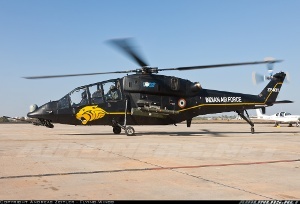 Split up between the Indian Air Force and the Industry (many HAL – Hindustan Aeronautics Ltd.) the flying program was well filled up. 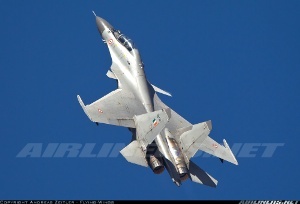 The Indian Air Force presented the Su-30MKI in the flying display, which made good use of ist thrust-vectoring capability. 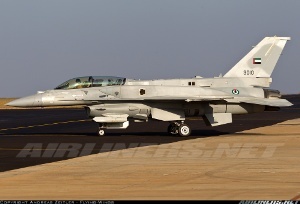 And seeing the mighty Suchoi fighter jet graciously taking off to the sky once again was a fine sight indeed. Apart from that the display was unfortunately a bit high and far away, but nevertheless some closer fly-bys made up for nice photos. 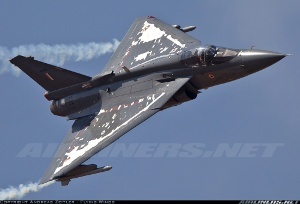 Tejas LCA (Light Combat Aircraft) was the next highly expected item in the air. 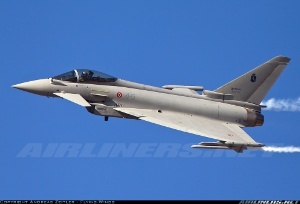 After receiving IOC late last year the HAL Test pilots worked out a display routine that should off some capabilities of this delta-winged light fighter. 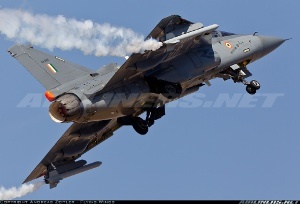 Looking at it from the outside the routine was not flown that tight and without any hard manoeuvres, but showed off the Tejas with good effect. 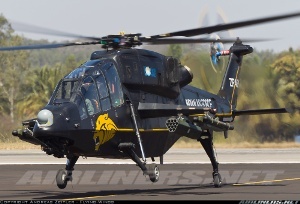 Another first was the first prototype of the LCH (Light Combat Helicopter), flying twice a day. Its performance looked very impressive looking at the fact that the helicopter has only accumulated around 60 flight hours and 60 flights before the show. 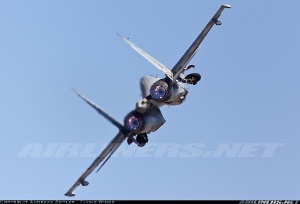 However it had to cut its display on Thursday short and to land quickly. 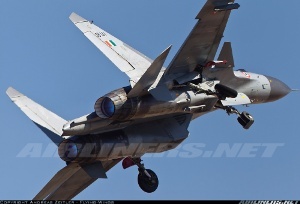 No details were revealed about the reasons, but it remained on the ground, only to take-off cautiously on Friday and returned back to the HAL factory. 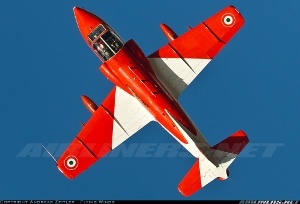 The HAL IJT-36, the future light trainer for the Indian Air Force (IAF) was also up in the air. 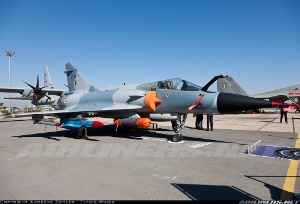 After its gear collapse in 2009 it performed well and the first example in IAF colours was also put in the static display. 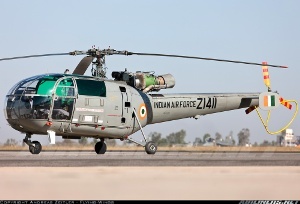 At the beginning of each block the Army showed furthermore three Dhruvs transporting a car and fast-roping special commandos as well as a HAL Cheetah / Alouette helicopter. 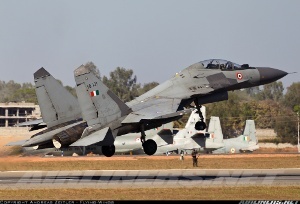 The competition for the Medium-Multi-Role-Combat-Aircraft(MMRCA), the successor of the venerable MiG-21, was the main point of this year's Aero India. 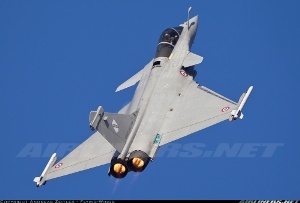 Apart from the Russian MiG-35 all remaining contenders, the Dassault Rafale, Lockheed F-16, Boeing F/A-18F, Eurofighter Typhoon and Saab Gripen were present at Yelahanka and participated in the daily flight displays as well as conducting passenger flights during the lunch break as well as in the evening hours. 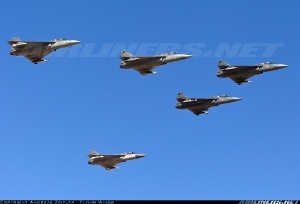 Lockheed showed of four "Fighting Falcons". 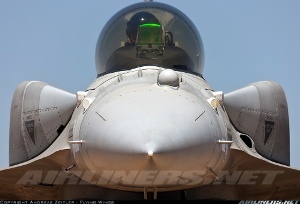 Two came from the US Pacific Air Force F-16 Demonstration Team and flew in from Misawa, Japan. 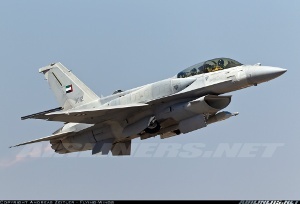 The presented the F-16 in the air. 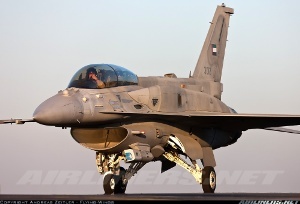 The other two F-16F were F-16F Block 60 "Super Falcons" of the UAE Air Force and used to promote the future F-16IN, also wearing stickers due to this occasion. These aircraft also flew daily with several people in the backseat. Three Swedish Gripen were parked on the other side of the airfield and did it equally to the other contenders: flying in the display program as well as performing incentive rides. 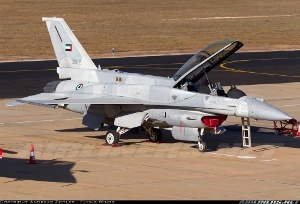 The two Rafales were especially interesting, as they belonged to the EC3/30 "Lorraine", based at BA 104 Al Dhafra in the UAE and also wearing these markings. 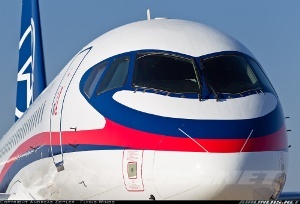 Of course the marvellous blue sky also literally the elegant shape of these aircraft in a good light. Apart from the grey jets some display teams brought a lot of colour in the air. 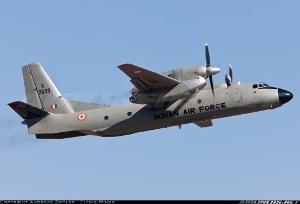 First and foremost the IAF Suryakiran (Sun Rays) Team, flying the HAL HJT-16 Kiran Mk.2 trainer aircraft. Their display does not need to hide away from those of other international display teams with its formation aerobatics, solo displays and crossing manoeuvres. 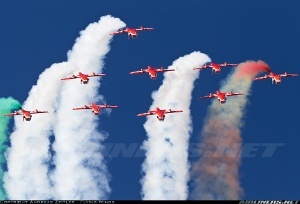 And especially the smoke in the Indian national colours orange, white and green looked excellent in the blue sky. 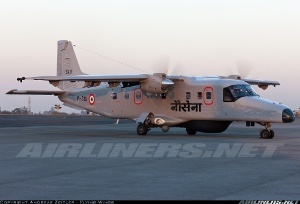 After 15 years flying the Kiran Aero India 2011 was their last display with this aircraft, as the airframes are urgently needed to train future IAF pilots. 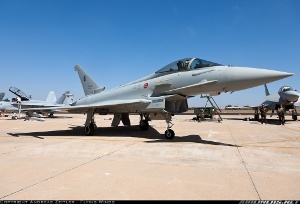 Rumours were going around that the team will continue, and might already be present at the next show in 2013, then maybe with its new aircraft, the BAe Hawk. Already known around Germany due to their appearance at the Berlin Air Show in 2008 is the Sarang (Peacock) Helicopter Display Team flying the HAL Dhruv. The Peacock is the national bird of India and the golden colour of its feathers painted on the helicopters fuselages came out especially well during the flight display in the evening hours. And of course there is nowadays any airshow without the participation by the famous soft drink producer from Austria. Apart from offering a nice bar to spend the last hours of the show it brought also the "Flying Bulls" team from the Czech Republic and their 4 Zlin 50 LX. The static display of the IAF was a slight disappointment as I was really hoping to see some MiG aircraft , so either a -27 or -29. 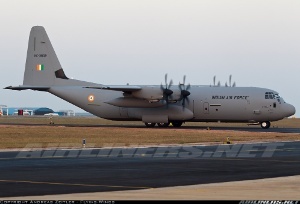 Unfortunately either of them was put on display, but 'only' for jets – Su-30MKI, Tejas, Mirage 2000 and Hawk - as well as the first C-130J for the Indian Air Force, that flew in to Yelahanka on Tuesday, only 4 days after setting up the new IAF C-130J Squadron. 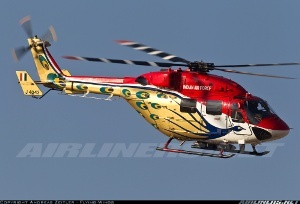 A Dhruv and the 2nd LCH completed the ground exhibition. The static display grew a lot compared to the previous years, but was mainly due to the expansion of the area for business jets. 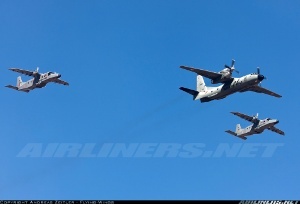 Apart from that only a few USAF aircraft were present and no sign of military aircraft from neighbouring countries. Maybe this could be pushed a little more in the future?! 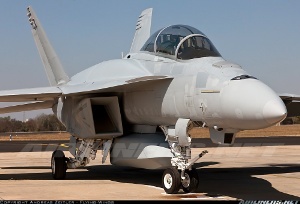 A special charm of the show is that it is being held on active military airfield, being home to transport aircraft and helicopters. So the morning and evening hours as well as the lunch break see not only bringing in some military visitors by air but also some local flying. 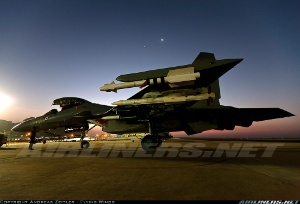 Mornings and evenings were thus spend hunting these Air Force assets in a nice warm and low light. 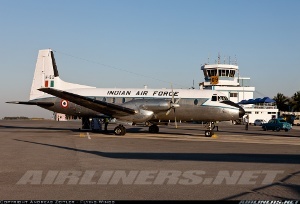 Usually in the morning a Embraer EMB135 brought in high rank military personal from Dehli. 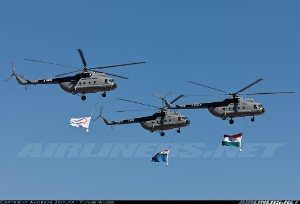 Then followed Alouette and Mi-8 helicopters with more guests on board. A special treat were the VIP-equipped HAL HS 748 Avros, adorned with a beautiful white/ polished aluminium exterior. The first of these aircraft were deliverd already in the 1964 and seeing these still operating was like travelling back in time. 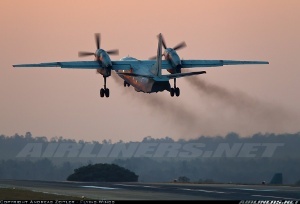 A large contrast was the Il-76 that was seen twice during my visit to Yelahanka. 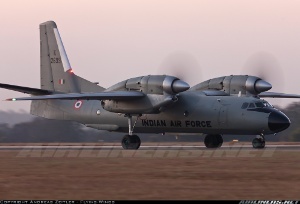 Local flying consisted mainly of Dornier Do228 and more Avros, as well as some An-32, the main workhorse of the IAF transport fleet. Looking back at Aero India 2011 I have to reflect that – looking at the whole package - it was not the smoothest running event, but looking at the access, the number of new aircraft seen and the marvellous weather with blue sky throughout the week well worth the effort and stress. And of course it wouldn't have run that smooth nonetheless without the help and support by my Indian friends. Thanks a lot to you, guys! 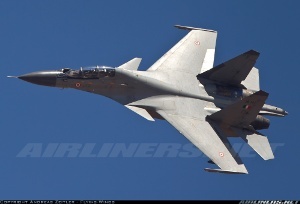 If this report should have risen your interest in Indian military aviation, you might want to consider digging through www.bharat-rakshak.com, and extensive resource about IAF. Obviously the visit to this show was part of a smaller trip to India, whose other highlights will be picked up in a separate report in the near future.